Jamie Weinstein, boyfriend of serial hoax-artist Michelle Fields, says Republicans should surrender to Hillary Clinton in exchange for one Supreme Court seat and some other chump change. 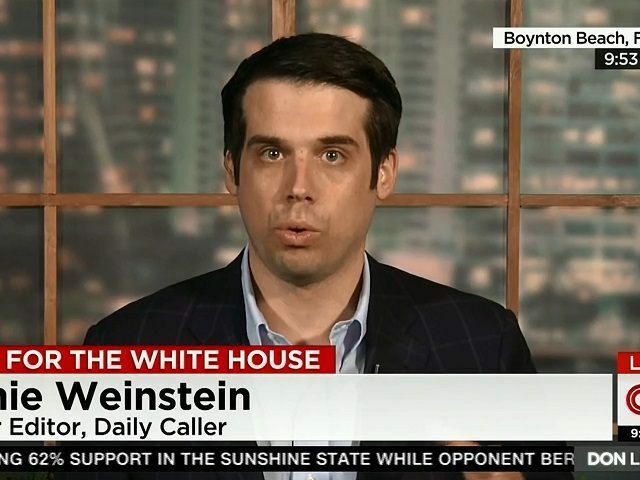 The Daily Caller's Senior Writer Jamie Weinstein, a member of the "NeverTrump" faction, has proposed a "negotiated Republican surrender" to Hillary Clinton. The suggested�deal rests on the assumption that Clinton is "on a glide path to the White House," and that Republicans would do best to appease her now. The terms: Republican�leaders agree to "rescind" endorsements�of Trump in exchange for one Supreme Court seat; rudimentary entitlement reform (read: higher taxes); a "Gang of Eight-style immigration bill"; a federal minimum-wage increase; up-or-down votes on future Supreme Court nominees; and a few national security appointments. Weinstein writes: "Ideally, the Republican delegation would include a wide range of respected Republicans and conservatives from both the establishment and anti-establishment, but for it to matter to Hillary, it must also definitely include Republican congressional leaders like House Speaker Paul Ryan and Senate Majority Leader Mitch McConnell (and as many other members of Congress as possible) who would actually be in a position of fulfill the commitments of a deal." All these phony #NeverTrump "conservatives" went along with everything out of Romney, McCain, and George Bush, yet they hate Donald Trump who is more right-wing than any of them. Perhaps they don't like Trump saying he's going to put America first.